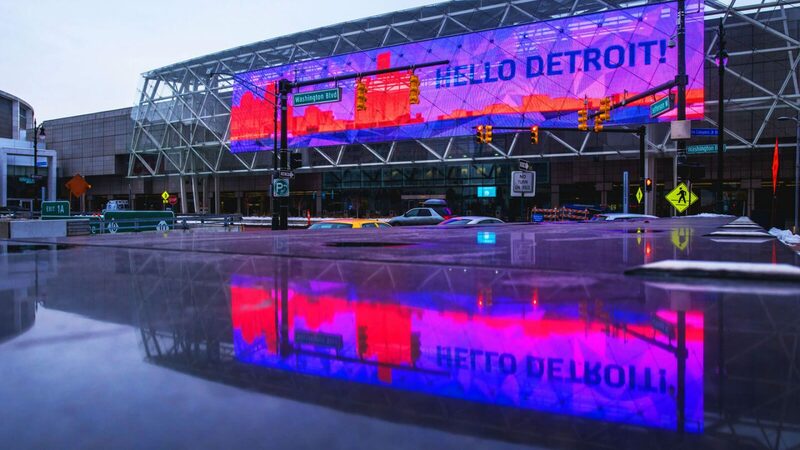 As part of a massive $299 million expansion plan for the Cobo Center in Detroit, the Detroit Regional Convention Facility Authority hired Gable in 2015 to install two large digital displays outside of the facility. 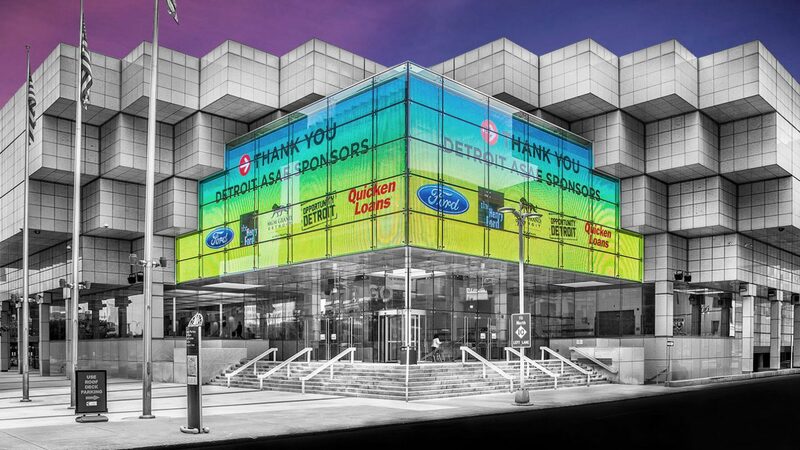 First opened in 1960, Detroit’s Cobo Center has undergone extensive changes over its 56-year history. Today, the Cobo Center is considered a ‘best in class’ U.S. convention center, ranking nationally in an array of categories. With 722,500-square-feet of prime exhibit space, the convention center is one of the largest in the nation. As part of its most recent massive renovation, Cobo Center looked to Gable to revamp the venue’s look and improve sales opportunities for the venue’s operators by increasing advertising opportunities for potential exhibitors. Gable delivered on all that and more, installing innovative solutions that provide a jaw-dropping experience – and have changed Detroit’s skyline. 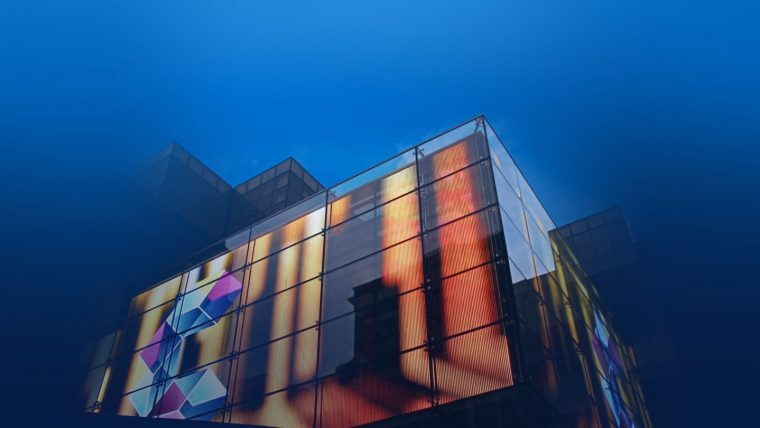 With the help of partners including TVS Design, SDG Associates, Rossetti and Albert Kahn Associates, Gable installed a massive LED Display, measuring 160-feet wide by 30-feet tall, overlooking W. Jefferson Ave. on the east side of the Cobo Center. The 6,000-square-foot display can now be seen in the distance when the city skyline is shown on Detroit nightly news. But up close, the display is even more remarkable. 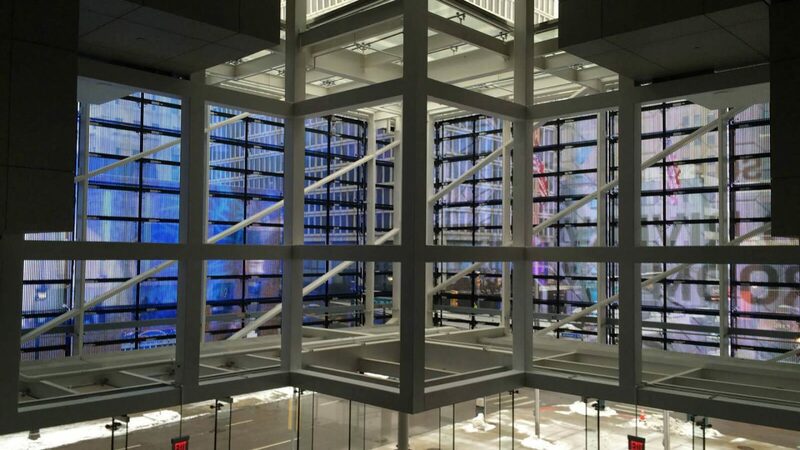 Fully customized to fit the curved architecture of the convention center’s main marquee, the display was also designed to allow light to pass through while operating, using an innovative LED mesh curtain display. 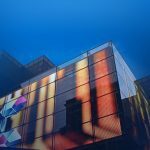 While COBO Center officials initially sought a standard 50mm by 50mm high-resolution screen, Gable was able to offer a fully-customized solution, featuring a 48mm by 24mm high-resolution screen and architectural elements that make the screen one-of-a-kind. 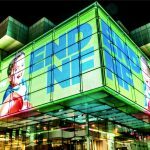 The screen provides high brightness levels, using 6 LEDs per pixel, allowing the full screen to be visible to those walking past the convention center, even in full sunlight. Overlooking W. Jefferson Avenue on the east side of the convention center, the screen was installed over the course of four weeks. Planning took two-and-a-half years. Fifty eight of 384 custom-made cabinets allow spider rods to pass through the screen and hold the curtain to the glass. Additionally, an array of eight speakers were installed on the outside of the screen and connected to a full AV system in a control center. 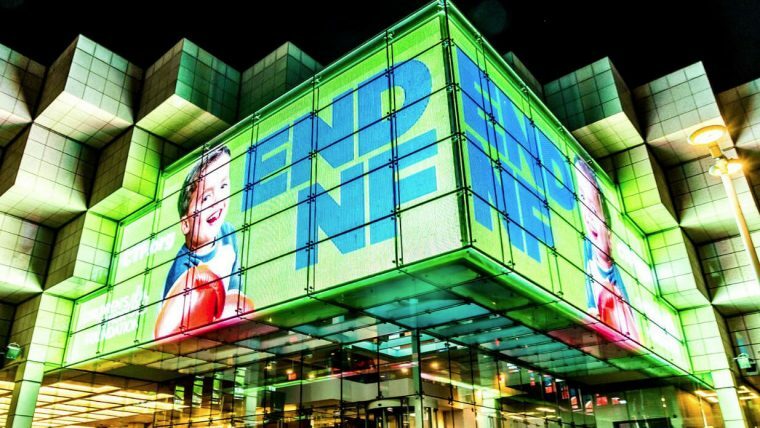 Gable also installed a 3,000-square-foot LED display at the corner of Washington and Congress streets outside of the Cobo Center. Added to the Cobo Center’s full facility fiber optic network and fully equipped broadcast studio, the screens are operated in-house – providing ease-of-use and flexibility to get the most out of the display. “Our customers quickly caught on to the fact that these signs can create substantial revenue streams,” Molinari explained. “Looking for new revenue streams, hybrid attendance revenue, advertising and sponsorship opportunities, real time news or event broadcasts from anywhere in the facility? 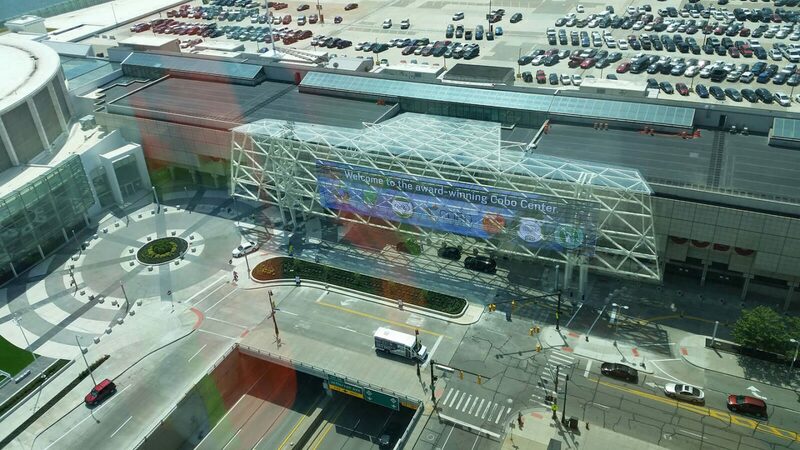 We can make it happen!,” the Cobo Center tells meeting planners on its website. 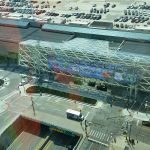 About Cobo Center: With 723,000 square feet of exhibit space, Cobo Center boasts one of the largest contiguous exhibit floor spaces in North America and is the 17th largest convention center in the country. For more information, visit www.cobocenter.com.